One of my favourite comic literary ideas is Douglas Adams’s Infinite Improbability Drive, which enables a spaceship to travel infinitely improbable distances by generating a field within which the infinitely improbable can, and does, occur. It’s a notion of genius, because (at least within the context of the story) it provides a plausible mechanism whereby absolutely anything can happen. In I Don’t Believe It, Archie, Andrew Norriss has come up with an equally clever idea. Archie is a child to whom unusual things happen just about every day, simply because - well, because they just do. After all, there are plenty of people to whom nothing unusual ever happens; and somebody must be at the other end of the spectrum, mustn’t they? It’s reasonable, uncomplicated, and - in Norriss’s hands - makes for a very entertaining book. It would be easy, given the premise, for the author to go completely overboard and introduce aliens, magic, and zombies; but he takes the sensible course of sticking to the believable but highly unlikely - so, for instance, Archie finds himself stuck in a house with an escaped leopard, or mistaken for a kidnap victim, or accidentally glued to the library doors by an inept protestor. The story is episodic, each chapter taking place on a single day in the same week, though young readers will love how the final chapter neatly ties all the others together. 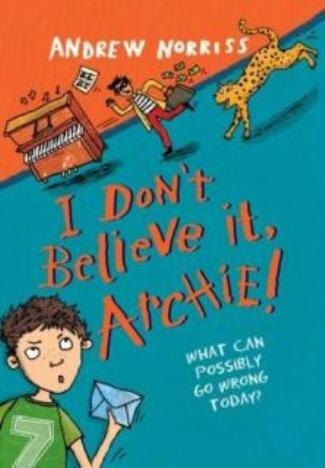 Archie himself is an endearing hero, resilient yet resigned - to the facts both that all these strange things keep happening to him, and that the grown-ups he meets just won’t believe his account of things. In fact, it’s easy to see Archie’s adventures as a metaphor for childhood - a time of life when much of what happens is unexpected, and when the grown-ups around you insist on imposing their own interpretations on events. Fortunately, in the first chapter he meets Cyd, a girl with a huge amount of common sense and the ability to remain calm in the face of strangeness. Both children are very believable and immensely sympathetic, and appealingly drawn by our own Hannah Shaw; and their developing friendship through the story is really quite touching. My own children loved the story - at the start of the summer I received a big box of books for review purposes, and this was one of their absolute favourites. I loved it too - it's funny, clever, and well-written - and one of the many things I love about the concept is that it leaves room for an unlimited number of sequels. I’m hoping that I Still Don’t Believe It, Archie is already in production. I Don't Believe It, Archie by Andrew Norriss, illustrated by Hannah Shaw. Published August 2011 by David Fickling Books. Hardcover price £10.99. Sounds a great book - and the fact that your children loved it is a great recommendation! Hooray! I'll tell my children. Don't suppose there's any chance of an advance copy...?? ?